Find more information about our new portal in this FAQ! We heard YOU, our most valuable users. 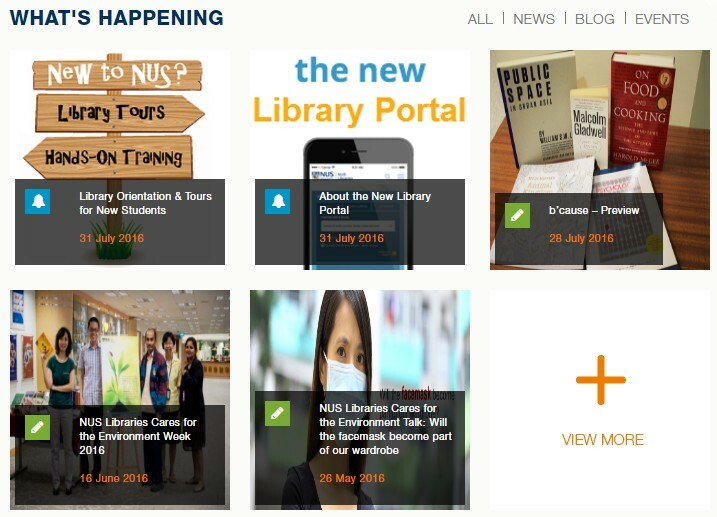 After months of talking and listening to the NUS community through surveys, focus groups and student projects, we are proud to present to you the revamped NUS Libraries portal! The same wealth of information with a new look and better functionalities. Click on one of the links below to get more information. We are excited to tell you that our website is now mobile-responsive! What do we mean? It means no matter what device you are using, you will see the same look across them all so if you're having an 'eureka' moment while commuting or moments before bedtime, all you'd have to do is grab your phone and go to the library portal. We have reduced the number of search tabs you have to select from with the default tab 'All' searching across our electronic and print resources. Oh no! Does that mean I can no longer search for exam papers? Do not fret. Some of our existing tabs, i.e. 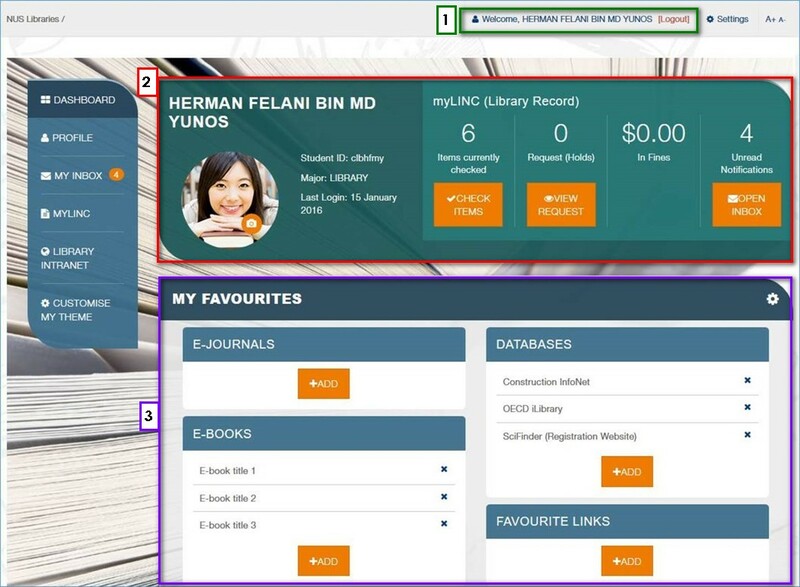 E-Journals, RBR, Exam Papers and ScholarBank, can be found at the bottom of the search box. Simply click on any of the links below the search box and a fourth tab will appear. The example below shows what happens after clicking on 'Exam Papers'. 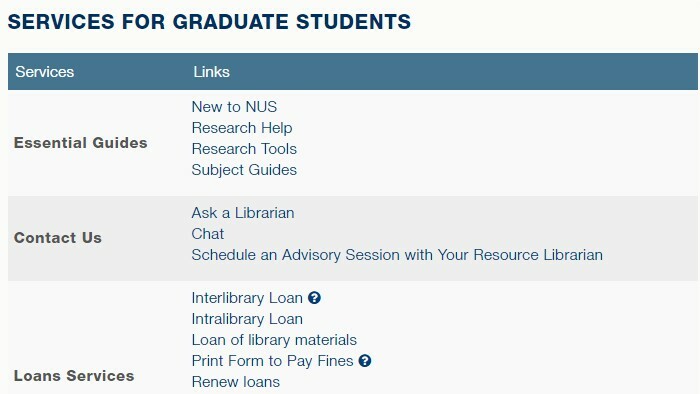 A new link named 'Guides' has also been added and this is where you can search across our FAQs and Library guides. Notice that the fourth tab has changed to 'Guides' in the example below. We have included quick links for easy navigation; whether you're trying to book discussion rooms or simply check your library account. 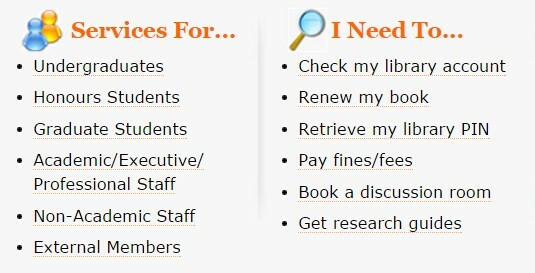 What about the Library Services available for us, e.g. Recommend books, a.k.a. 'Services For...' in the old portal? Following are the steps to access our e-forms. 1. Click on the arrow next to 'More Services For...' and a dropdown list will appear. 2. Choose your current designation, e.g. Graduate Students. 3. You will be brought to the page with the list of services available. 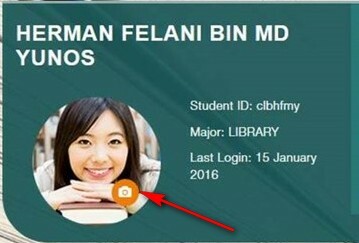 There will only be 1 login button named 'myPortal', which will be available on all pages of the library portal. 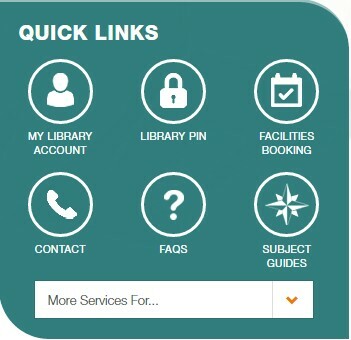 After logging in (1), you will see a dashboard where you can view your library account at a glance; the number of items borrowed, number of holds, amount of fines, etc. (2). You can also add links to your favourite e-journals, e-books, database, etc (3). This feature lets you access your favourite items once you have logged in. No more searching for them from scratch! To do this, simply click on the camera icon and upload your desired image. [Update 10 August 2016] This feature is now up and running! Please head here to find out how to add favourites to your library account. This is currently being worked on. We will update you when it is up and running! What happens to existing settings/favourites? Your existing personalizations from the old portal will be transferred over when you login to our new portal. There is no need for you to do anything as we will do the transfer. 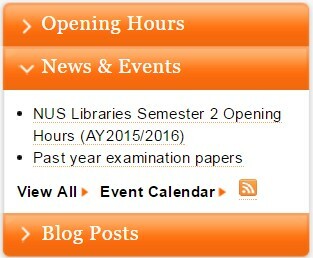 Our opening hours can now be easily spotted on the library portal. 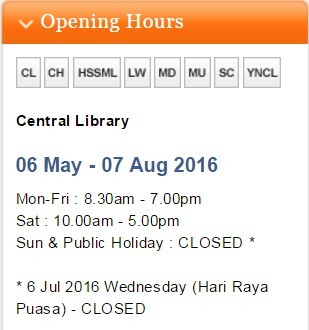 Previously, you had to use multiple clicks to find out the opening hours of another of our libraries. Now? No more clicks! In the new portal, the hours of the day for all libraries are listed. 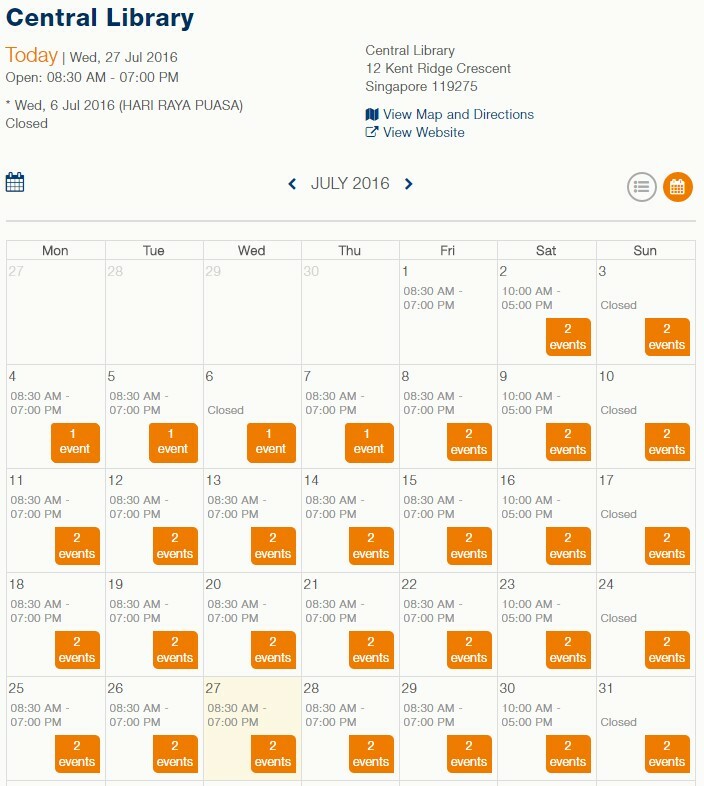 To find the opening hours for other days, click on the date or the orange arrow and select a date from the calendar. The opening hours will change accordingly. More information on library events like publishing talks or library tutorials are available once you click on 'More Opening Hours' at the bottom. 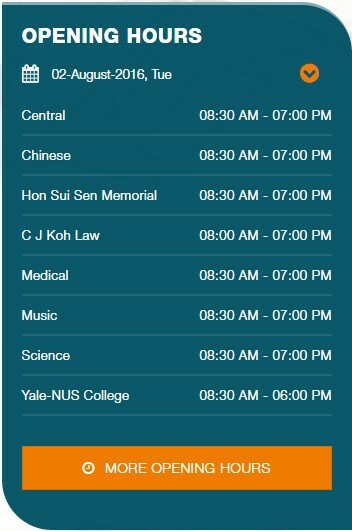 Here, you will be provided with an overview of the events held in respective libraries. 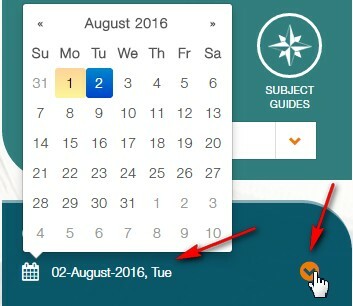 To know more about an event, click on the orange buttons which say '2 events'. The News & Events page will be known as What's Happening. Examples of posts you will find here are event announcements, entries from the library blog and announcements about our online resources. Instead of the lines of text as seen in the old portal, you will now see image tiles. 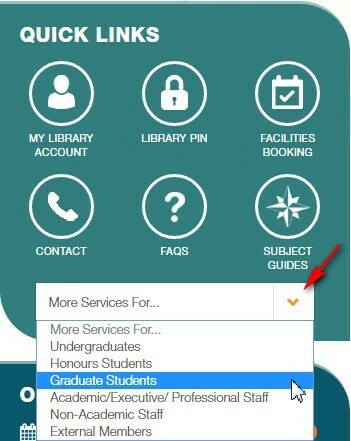 [Update 28 October 2016] A new feature, the 'Settings' button next to myPortal, has been added to the library portal. 2. 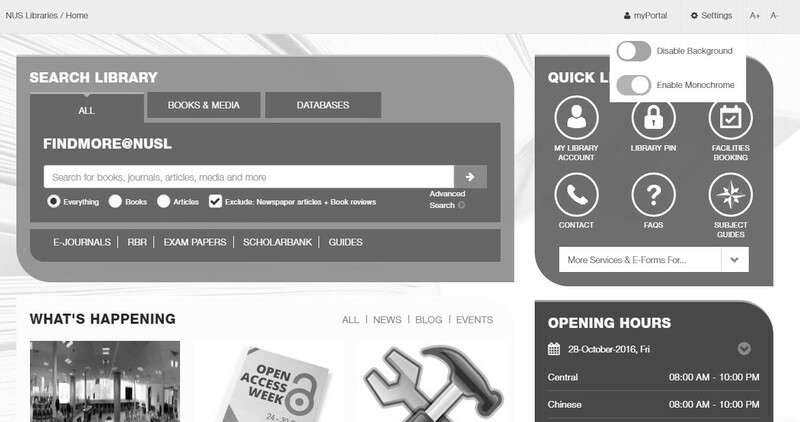 Or Enable Monochrome which changes the colour of the library website. This improves the readability for users who have low vision/colour blindness. Note: This works for all pages and microsites of the library website only. You will start seeing the new portal ​from 1 August 2016 (Monday). As with everything new, our bug hunters are constantly checking the portal to ensure that everything runs smoothly. Please pardon the bugs (if any) you encounter while using our new portal. The new look for our Special Libraries' Websites will be ready at the end of November 2016. Be sure to look out for the changes!